Newt Gingrich was bitten by a penguin at the Saint Louis Zoo on Friday during a private tour, zoo officials said. The candidate was on the tour before giving a speech to the National Rifle Association convention when "he was nipped on the finger" by a Magellanic penguin, Susan Gallagher, the zoo's public relations director, told Reuters on Monday. A Band-Aid, she added, "took care of the injury." 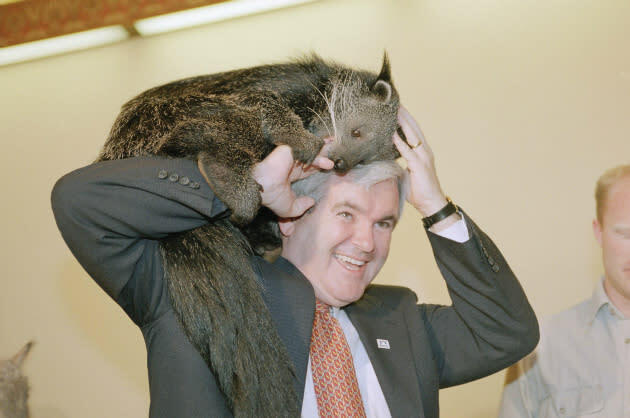 Gingrich has made frequent zoo visits a part of his presidential campaign, and he even wrote the foreword to 2008's "America's Best Zoos: A Travel Guide for Fans & Families." He's the GOP's Jack Hanna, if you will. In 1995, then-House Speaker Gingrich was bitten on the chin by a baby cougar following a Capitol Hill news conference, drawing a spot of blood. "Newt is a zoo fan," Gingrich campaign spokesman R.C. Hammond said. "He will be back."